Self-assembly is an elegant and scalable way of making complex nanoscale structures. But it only works for soft matter – the archetypal self-assembling systems are bars of soap and pots of hair gel; they’re soft because the energies that cause their components to stick together are comparable with the energies of thermal agitation. Is there a way of overcoming this limitation, and using self-assembly to make complex nanoscale structures from hard materials, like ceramics and (inorganic) semiconductors? There is – one can use the soft structure to template the synthesis of the harder material, so that the hard material takes up the intricate structure of the soft, self-assembled structure one starts with. It’s possible to use this templating technique to make glass-like materials, using so-called sol-gel chemistry. But up to now it’s not been possible to make templated, nanostructured elemental semiconductors like silicon or germanium. Two papers in this week’s Nature (Editor’s summary, with links to full articles and commentary, for which subscription is required) report the achievement of this goal for the case of germanium. To do this, the first requirement is a chemistry for synthesising germanium that works in solution at moderate temperatures. No such chemistry exists that uses water, so another solvent system is needed, together with a compatible surfactant that self-assembles in this solvent. The two papers manage to overcome these barriers in ways that are different in detail, but similar in principle. Sarah Tolbert’s group, from UCLA, uses ethylene diamine as the solvent and the cationic surfactant CTEAB (a very similar molecule to that found in some mild domestic disinfectants) to form the self-assembled nanostructures, which in their case took the form of hexagonally packed rods. Mercouri Kanatzidis’s group at Michigan State used formamide as the solvent and a somewhat different cationic surfactant (EMBHEAB). Both groups used variants of the so-called Zintl salts, in which germanium is combined with a reactive metal like potassium or magnesium. In both cases the germanium is disordered on the atomic scale, but with good long-ranged order on the larger length-scales, that reflects the relative perfection of the original self-assembled soapy structure. The UCLA group manage to remove the surfactant, leaving a nicely hydrogen-terminated germanium. 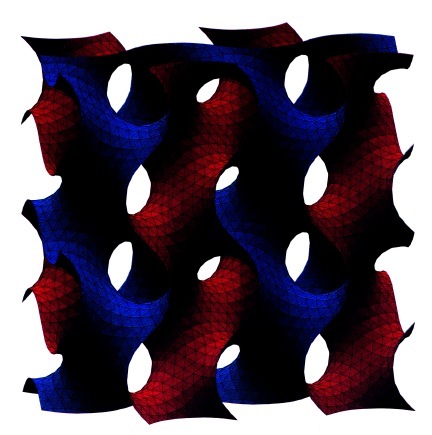 The Michigan State group were unable to get rid of their surfactant, but on the positive side the structure they formed was the very beautiful and potentially useful gyroid phase, a high-symmetry structure (see the picture) in which both the material and the pores are continuous. Immediate uses of these structures follow from the fact that the optoelectronic properties of the material are strongly affected by its nanostructured form, and can be further changed by adsorption of matter on the semiconductor’s surfaces, offering potential sensor applications. The gyroid phase, a cubic bicontinuous structure formed by some self-assembling surfactant systems. This structure has now been formed from elemental germanium using a templating process.